These comfy crochet starlight slippers are the perfect winter slippers to lounge around in. The slippers will make a lovely last minute gift for someone special. 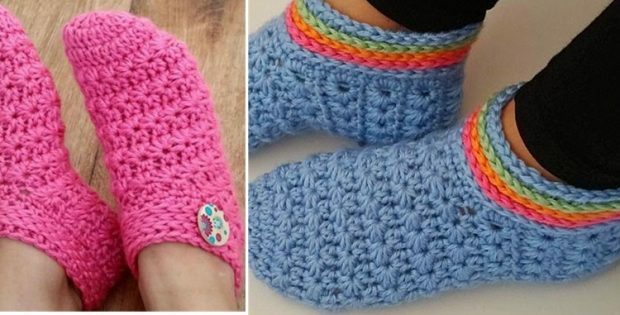 You can easily put your own stamp on these crocheted slippers by adding different colors to the cuff. These nice and comfy crocheted winter slippers have been designed by Kinga over at My Hobby Is Crochet. She has designed the pattern in just one size. However, it would be quite easy to adjust the size to one that fits anyone in your family. To access the FREE crochet pattern for these lovely slippers from My Hobby Is Crochet, please click here: Starlight Women Slippers Pattern.